Fed up of your daily lunchtime sandwich? 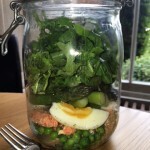 Then pack yourself a delicious salad pot bursting with the flavours of spring and brimming with goodness. You can whizz up this salad in 10 minutes. The egg, asparagus and salmon need to cool so you can prepare them the night before and assemble your salad in seconds in the morning. Salmon is a great source of protein and omega 3 fats which help to keep our hearts and brain in tip-top condition. If you don’t have a steamer you can oven bake your salmon and cook the asparagus in the egg water for 1 minute or until just tender. When you’re ready to eat, simply tip the pot upside down so the dressing coats the salad and dig in with a fork. Frozen peas are really handy for lunchbox salads. They defrost by lunchtime and add folic acid and vitamin’s C and K to your lunch. Place the egg into the base of a steamer pan. Cover with water and bring to the boil. Meanwhile wrap the salmon lightly in parchment paper and place inside a steamer on top of the egg pan. After 4 minutes, place the asparagus spears into the steamer around the salmon. Steam for 2 minutes or until the asparagus is just tender. Check that the salmon is cooked through and remove from the heat. Rinse the asparagus in cold water. Leave the egg, salmon and asparagus to cool. Place the lemon juice, olive oil and chopped mint into the bottom of a large sealable pot. Add plenty of black pepper and a pinch of sea salt and mix well. Flake the salmon into the jar. Chop the asparagus into 2cm strips and add to the jar. Add the peas and top with the rocket leaves. Seal the pot and keep cool until lunchtime.